He likes doing things a little differently to the mainstream golfers. Yet the recent Travellers Championship winner in the US Bryson DeChambeau won’t be using a compass again to mark hole locations in his greens book. 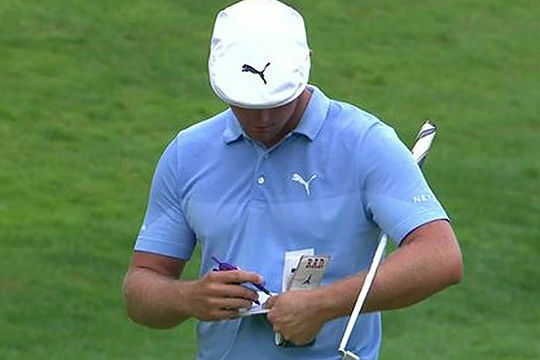 The USGA has ruled the compass was “non-conforming”, meaning DeChambeau can no longer use it just to check on true pin locations before he plays his shots to the green. Initially the USGA told the American he could use the compass but they’ve since had time to think about and analyse that decision before they informed DeChambeau it was outside the Rules of Golf. “The USGA has ruled that the use of a protractor (also known as a drawing compass) during a stipulated round is a violation of Rule 14-3a of the Rules of Golf. “I’m figuring out the true pin locations,” he said. The USGA released a statement to GolfChannel.com which, in part, said: “At the request of the PGA Tour, the USGA and the R & A reviewed Bryson DeChambeau’s stated use of a drawing compass to assist him in determining ‘true’ hole locations, and jointly determined that his specific usage would be in breach of Rule 14-3, if used in a future round. “Because a compass is not a usual piece of equipment in golf, and Bryson clearly stated that he had used the device to assist him, the USGA, R & A and the PGA Tour agreed it was in the best interest of the game to share this determination with Bryson immediately.